Cove Towers arguably offers its residents some of the most picturesque, unobstructed views available in the Naples area. With the proliferation of beautiful communities that Naples has, that is saying a lot. Cove Towers’ property is tucked away in a secluded area bordering the Wiggins Preserve. Every condo has front and rear views that are incomparable. Each has views of the preserve and the tranquil waters that permeate the lush mangrove habitats that are home to a plethora of Southwest Florida’s finest winged and four-footed residents. Upper-level condos have a clear view of the Gulf of Mexico and its spectacular sunsets. Gated and guarded around the clock, homeowners leave the wonderful world of Naples behind only to pass into a world of private luxury and elegance where peace and tranquility are more than descriptions. They are a lifestyle. The first three luxury condominium towers, the Aruba, the Bequia, and the Caribe, were completed in successive years from 1999 to 2001, respectively. The larger and more luxurious Montego and the Nevis condos were opened in 2002 and 2003. Aruba, Bequia, and Caribe comprise a community unto themselves, as do the Montego and Nevis. The original group of three have only four condos per floor. Each of these buildings has elevators that open to covered walkways that lead to the individual condo entrances. This is a style typical of many Southwest Florida condo towers. Each successive building features larger floor plans than its predecessors. Aruba was the initial building. It features four different floor plans ranging from 1,608 to 1,750 square feet plus covered terraces that range from 211 to 250 square feet. Each condo faces west toward Delnor-Wiggins Pass State Recreation Area and blue waters of the Gulf of Mexico. The building has 15 floors and 50 condos. Bequia is also 15 stories and has 55 units with four different floor plans with four condos per floor. Living spaces are similar to those in Aruba, but are slightly larger on a comparable layout basis, up to 1,900 square feet. Like Aruba, Bequia also faces west. The Caribe completes the original trio. It features 18 floors with four condos per floor, for a total of 56 units. Again, four different floor plans are available, but they range in size from 1,854 to 2,491 square feet. Some terraces at Caribe are more than double the size of those in Aruba and Bequia. Each of the floor plans in the Aruba, Bequia, and Caribe are three-bedroom, two-bath or some variation thereof. Residents of these towers may, if they wish, join the neighboring, exquisite Tarpon Cove Yacht and Racquet Club. Although the Tarpon Cove privileges are also available to residents of Montego and Nevis, these residents have exclusive access to the on-site Calypso Club. The club provides a pool and spa and all of the usual clubhouse-style social amenities, including a party room, a fitness center, and an outdoor pavilion with a fireplace. The clubhouse also includes two guest suites. Montego and Nevis have elegant lobbies with elevator service to each condo’s private foyer. As with the others, these each has four units per floor and four different floor plans in an 18-story building. The 58 three-bedroom, three-bath units in Montego range from 2,379 to 2,645 square feet of living space plus terraces that are approximately 500 square feet. The 58 condos in Nevis are the largest in Cove Towers, with 2,556 to 2,760 square foot floor plans. Each unit has three bedroom and three-and-one-half baths. While Cover Towers offers a distinctly peaceful and tranquil lifestyle, its location adds the benefit of convenience. Horse Creek Drive takes residents east to the city of Naples, and access to the golf is direct and a very short distance. Tarpon Cove Yacht Club even has a pontoon boat that ferries members to the beach. North and south access is available via Vanderbilt Drive or Tamiami Trail (US 41). 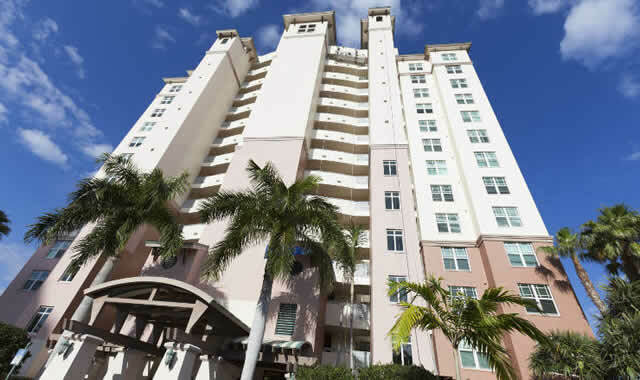 Cove Towers is unique among Naples communities.